Start and end in Cuzco! With the hiking & trekking tour The Inca Trail, you have a 9 day tour package taking you through Cuzco, Peru and 8 other destinations in Peru. 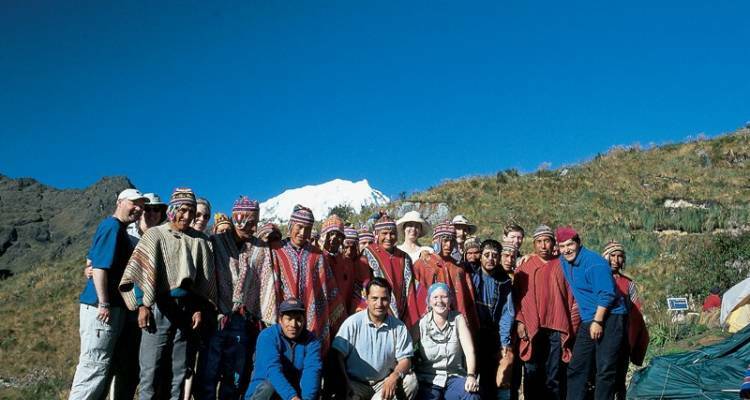 The Inca Trail is a small group tour that includes accommodation in a hotel as well as an expert guide, meals, transport and more. The level of patience and motivation Marcia showed everyone during the tour was amazing. The horsemen and the chef and spud chef prepared unbelievable meals throughout. Day 1: Start Cuzco (3400m); free time to explore the Inca capital. Day 2: Free day; optional Sacred Valley excursion. Day 3: The Classic Inca Trail: Start Inca Trail trek from km82; walk along Urubamba River, climb to Huayllabamba. Day 4: The Classic Inca Trail: Cross Dead Woman's Pass (4215m), then descend to Pacaymayu. Day 5: The Classic Inca Trail: Over Runquracay Pass (3800m) to ruins of Sayajmarca and Phuyupatamarca. Day 6: The Classic Inca Trail: Walk down Inca steps to Wiñay Wayna and Machu Picchu via the Sun Gate. Day 7: Guided tour of Machu Picchu; free time to explore further; return to Cuzco by train and road. Day 8: Free day in Cuzco; optional activities available. I'm lacto-ovo vegetarian, would I run into any dietary problems on this tour? The tour meals can be accommodated to your dietary needs by the operator. Start and end in Cuzco. TourRadar only requires a deposit of $99 to confirm this Exodus Travels booking. The remaining balance is then payable 60 days prior to the departure date. For any tour departing before 20 June 2019 the full payment of $1,714 is necessary. No additional cancellation fees! You can cancel the tour up to 60 days prior to the departure date and you will not need to pay the full amount of $1714 for The Inca Trail, but the deposit of $99 is non-refundable. Covering a total distance of approx 256 km.